Your company website has a big role to play in your branding and marketing endeavors. So, it must look professional, but at the same appealing and attractive. Other than this, it should offer great user experience (UX) too. Believe it or not, the typography you pick alone can greatly affect your branding. This is because by picking a unique font or typography you can make your company website stand out from the others. On the other hand, by selecting a font or style that’s been used thousands of times already by many other websites you may risk your own website losing its identity in the ever-expanding commercial landscape. Now, choosing a unique and attractive font style is important for your website. However, so is the size. The modern and chic websites of today are all about large-size and bright fonts which is why that’s what you should go for as well. This applies to not only the hero image text and headers but the paragraphs and links too. The primary reason behind this is that large fonts are easier to read and prevent your website looking too “congested”. It also won’t hurt to read a guide to using beautiful typography to familiarize yourself with the basic techniques and methods for quality web designing. 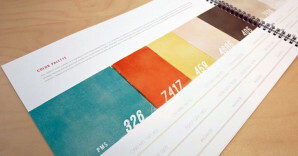 When picking the colors for your website, you want to stick with a particular scheme. Randomly selecting whichever colors you like can easily make your website look “gaudy”. • Analogous colors: These are the colors that are located close to each other on the color wheel. For instance, you can use dark green with light green, or light green with light yellow, etc. • Complementary colors: This is another popular color scheme in which the colors complement each other. For instance, red goes with green, purple with yellow, or blue with orange. • Monochromatic colors: These are basically different shades of a single color. However, this scheme requires a certain level of carefulness because even if you use different variations of a single color, the design can still look bland and boring. You can’t finish your company website without branding, can you? Since one of the most important elements of all forms of branding is a unique logo design, you must have one of yours as well that you can use at various spots in your website- the header, browser address bar icon, footer, etc. However, you don’t have to go at great pains for the designing part as you can simply use an online logo generation tool. The SEO i.e. search engine optimization is important as it can help your website rank better on popular search engines such as Google and Bing. For this, you will need to pick the right tags (headers), metadata, headers, footers, etc. You also need to focus on responsive web design which can help your website adapt to different types of displays i.e. large ones like laptops and computers, and small ones like smartphones and tablets. In fact, the tech giant Google itself recommends responsive web design. So, you can imagine how big of a hit your website will take regarding its online presence if you choose to ignore this point. While the top center of your website is all about the business highlights and main services/products you offer, the bottom is ideally reserved for the information. The footer thus should contain all the important links such as “About Us”, “Contact Us”, etc. You can directly display your address, email, contact numbers, etc. as well as a minimap that can be used by a customer/client to locate your office. Your company website is your online identity. Its performance and design affect how your customers and business-partners feel about your brand, which in turn affects your overall success. Thus, be sure to give it all the time possible so that the end result is up to the mark.